Occasionally, we get questions from customers curious about how their dog’s DNA is processed into the genotype data that we analyze to understand breed ancestry and health risks. Once we receive your dog’s cheek swab, the DNA contained in the sample is copied many times in a process called amplification. Next, all of those copies of the DNA are “chopped up” or fragmented into small pieces. 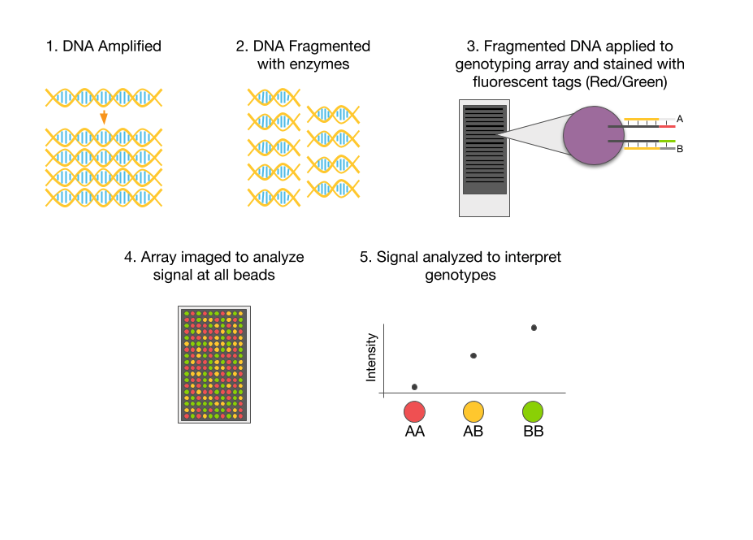 That fragmented DNA is then applied to Embark’s DNA chip, also known as a genotyping array. This chip contains hundreds of thousands of tiny silica beads, each of which is covered with hundreds of thousands of identical short DNA probes that are specific to a single location in the dog genome. Once the fragmented DNA has time to stick to these probes, they are labeled with fluorescent stains (red and green) that are specific to each DNA variant, or allele, at a marker. These fluorescent probes can then be analyzed to generate a readout of the intensity of each color at each marker. Pretty different, right? If your dog fails genotyping on the first try, make sure to take a second look at our swabbing instructions. It may help to try to stimulate saliva production by letting your dog smell their favorite treat (but don’t let them eat it) prior to swabbing. A few of our customers have expressed concern that sample contamination has led to surprising breed ancestry results. These examples illustrate how it is actually impossible for us to analyze a contaminated sample! Chimeras are individuals that have cells in their body from two different individuals! This happens in dogs and humans alike on occasion. Most commonly, this is the result of an individual absorbing a sibling very early in the developmental process. We’re not actually sure how common this is in dogs yet. More importantly, just because a dog has some chimeric cells in their body does not mean they will have chimeric cells in their mouth/saliva. We haven’t seen many cases like this, but rest assured that if this happens with your dog, we will let you know! I hope that this primer on DNA genotyping has helped you to understand how the data that we analyze is generated. As always, thanks for Embarking with us! After studying human pre-history using genomics for nearly a decade, Aaron decided to start barking up the dog family tree. He’s now a Senior Scientist at Embark in the Ithaca, NY office.